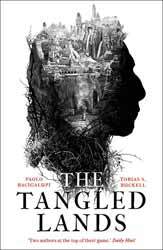 The Tangled Lands (2018. 294 pages) is a small collection of four stories, all set in the same world. The two authors, Paolo Bacigalupi and Tobias S. Buckell have each contributed two stories. The dystopian fantasy stories are based in a world where, at one time, magic was ubiquitous, with both small and large acts happening every day. Great Empires were built and magic contributed to health and the splendour of the kingdoms. That is, until the brambles started to appear. Somehow attuned to magic they grew in direct response to its use. Worse still, the brambles held needles which, if they pricked you, would cause a form of deathless sleep. Growing thick and fast the brambles could overwhelm towns and villages, even overwhelm whole kingdoms. Magic still exists in the world, but because of the brambles its use has all but been prohibited, on pain of death. Beneath the surface the stories are an effective ecological allegory. Even faced with the death of everything they know most of the characters still feel like they should have a right to use small magic, after all what could a little do? This lack of insight into the collective harm done by many is not unlike modern attitudes to pollutants. After all, what harm does one car do, or one person who uses and disposes plastics? On a planet the size of the Earth, the honest answer would be that it would have little impact. But when that idea is shared by six billion then the impact becomes catastrophic. The same thing holds between the symbiotic relationship between the brambles and the use of magic. I guess human beings are not very good at looking out for the collective good. The strongest of the four tales are the opening and closing stories. 'The Alchemist', by Bacigalupi, tells the tale of a man who has lost everything, except his daughter, to the brambles. Driven by a desire to push them back, and in the process regain some of his lost wealth he works tirelessly for years to perfect a machine which will kill the vegetation. Near the end of his resources it looks like he has succeeded, but will others use his machine for good or evil? Being the first story it was particularly important that it carried most of the world building. For the most part this was done by restricting the tales to a single surviving city. The setting is the usual faux medieval, with the one difference that, as other cities fell, Khaim became host to a wave of refugees. Mostly these people have been settled across the river in Little Khaim, where the velvet classes exploit their poverty and helplessness for their own gain. The following two stories, 'The Executioness' by Buckell and 'The Children of Khaim' by Bacigalupi, both cover the theme of loss, the first sees a mother's loss of her children, the second the loss of a sister. The stories are not as strong but are useful in being able to add colour and background to the world. You realise how low some people can sink when you discover what they do with the perennial sleepers. The last story, 'The Blacksmith's Daughter' by Buckell is the second best in the collection as it looks at the socioeconomic disparity between the wealthy, who feel entitled to flaunt the law and the refugees who remain hostages to poor fortune. Overall, it was a good collection, but it had one major flaw. The idea is good, the execution interesting, but with four short stories you never get the feeling that it comes to any satisfying conclusion. Let's hope the next foray into Khaim is a full novel.